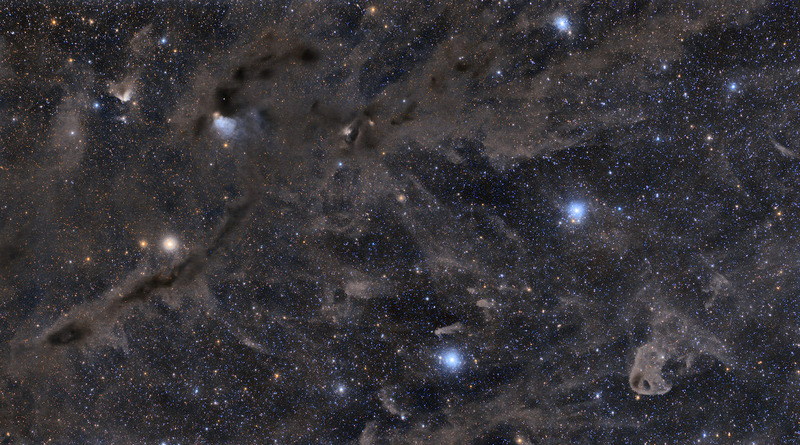 Explanation: In the dusty sky toward the constellation Taurus and the Orion Arm of our Milky Way Galaxy, this broad mosaic follows dark and faint reflection nebulae along the region's fertile molecular cloud. The six degree wide field of view starts with long dark nebula LDN 1495 stretching from the lower left, and extends beyond the (upside down) bird-like visage of the Baby Eagle Nebula, LBN 777, at lower right. Small bluish reflection nebulae surround scattered fainter Taurus stars, sights often skipped over in favor of the constellation's better known, brighter celestial spectacles. Associated with the young, variable star RY Tau, the yellowish nebula VdB 27 is toward the upper left. Only 400 light-years or so distant, the Taurus molecular cloud is one of the closest regions of low-mass star formation. At that distance this dark vista would span over 40 light-years.